Nintendo's Wii has featured many fun and enjoyable mini-game compilations aimed at the casual player, with Nintendo's own Wii Play and Wii Sports marking the template for many similar titles. 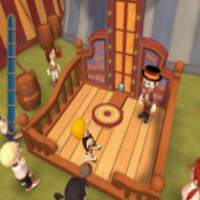 The latest release to capitalize on this trend is the entertaining Carnival Games, which allows you to go the circus and play such classics as Alley Ball, A Day at the races, ring toss and dunk tank to name a few. Players can win virtual prizes, unlock super games and more all with the flick of a wrist. Carnival Games is surprisingly accurate in mimicking the feel of these classic amusements, but its replay value is disappointing due to the limited nature of its games. 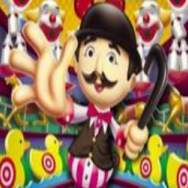 Based on the popular carnival amusement games that all of us played as kids, Carnival Games from GS Software on Wii takes you back to the midways and throughways of the old rides and fairs that travel through the country. Many of the games and things you'll find have been faithfully recreated and should be instantly familiar. This is definitely a lot like going through a time machine and reliving your youth. Before you begin playing through Carnival Games, you can create your own Mii-like avatar to play as, which is cool and allows you to put yourself into the action, though you can't use the actual Mii you created on the console, which is annoying. There are limited customization options available at first, but you can unlock additional items such as shoes and shirts by winning tickets in the mini-games. As you begin your journey onto the main throughfare, you'll find that the games are divided into separate themed alleys which contain a small fraction of the games. Each one of these smaller area contains a selection of games you can use and a super game that can be unlocked by winning the smaller games. Once you've selected which section you want to explore, you can then begin to play each of these titles. 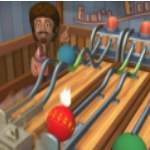 You can play each one as many times as you like and win prizes and tickets by achieving high scores in each. The objectives vary and this makes the difficulty of each game in the title vary depending on the threshold that's set for tickets. As you win bigger and bigger prizes, you can then unlock the super games which are nearby. It's a relatively simple structure and this approach makes Carnival Games instantly accessible for players of all abilities. What's most impressive about the game is the number of games available. In all, Carnival Games allows players to choose from more than two dozen fun and humorous mini-games in all based on classic carnival attractions. The games include such favorites as the frog jump where you have to hit a frog on a platform onto lily pads which is a lot trickier than it sounds and requires good timing in addition to skill. You can also play milk bottle shooting and try to knock off all three bottles with a single throw, try and hit the moving duck targets in the shooting gallery game, which is loads of fun with multiple players. You can also test your skill and throw the pigskin through a moving tire in throw for a pass in the football mini-game. This is a lot of fun and another sports themed one has you attempting to throw as many basketballs as you can into the hoops before the timer runs out. One of the classic carnival games has you aiming your water gun into a clown's mouth until it explodes, and hope to beat your opponents who are trying to do the same thing. It's not as easy at it sounds. The old darts game has you aiming for and attempting to burst a series of large and small balloons with your darts. One of the most fun things in Carnival Games is its excellent Skee-ball game where you have to roll a ball up the ramp and try and sink it into different targets for a high score and tickets. This version of the game is surprisingly accurate and moving the wii-mote in the same motion adds to its authenticity. You can also play a classic skill game Ka-Pow where you have to try and knock out the clown heads while avoiding their large fuzzy hair. Another mini-game is surprisingly tricky is the Lucky Cups where you have to roll a ball around a series of cups and while avoiding the blue ones. Each game you win earns you extra points which turns into tickets that you can redeem in other areas of the Carnival. Additional games allow you to try and hit the targets in Ring toss, guide an item over an electric wire without contact in nerves of steel, throw balls into holes to move your horse in day at the races and many more. Carnival Games also includes a number of more elaborate, arcade style modes where you have to use the tickets you win in the main games in order to play, these include the classic Dunking game, where you have to hit a target and sink a carnie, hit a mallet onto the board to test your strength or have the swami answer simple questions in this mystic attraction. As stated earlier, there are loads of mini-games included in this package and the most impressive thing is how authentic everything in Carnival Games feels. The wii-mote is used expertly in aiming and throwing which makes most of the game fairly intuitive to play. Before each game begins, you are given a quick note in the menu on how to play, which makes things even more accessible. The games themselves feel accurate and are nicely crafted. Each of the smaller games is fun to play in isolation and the package looks fairly decent by Wii standards, and has an appealingly cartoonish appearance throughout. The visuals do a nice job in recreating the feel of a fun fair, but Carnival Games won't blow anyone away with its average visual presentation, generic music and sound effects. While it's enjoyable as a solo game, there's also a cool multiplayer mode which adds to the competitive entertainment value substantially. Unfortunately, Carnival Games suffers from the same problems that most other mini-game collections do, in that it's fun to play in short bursts, but becomes a bit tedious upon repeated plays. While it's enjoyable trying to collect all the prizes and unlock the all of the bonus games, the individual games suffer once you get the hang of them and learn their tricks, making them much too easy and reduces the game's appeal over the long-term. Since most of the games are available immediately, you have little impetus to keep playing and this also works against the title. While its appealing to casual players looking for a short burst of entertainment, Carnival Games lacks depth and extended play isn't likely to be as satisfying as you'd expect.